A spate of violence, and clashes with police, at football matches has spurred Mexico’s congress into action. 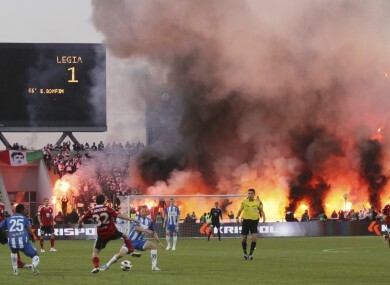 File photo from a Polish football match 2011. POLITICIANS IN MEXICO are seeking to quell a worrying trend of football hooliganism with stringent jail terms. Mexico’s Lower House of Congress has approved legislation to impose up to four years in prison for fan violence at sporting events, days after football aficionados fought police at a game. The bill, approved by the house on Thursday, calls for prison terms ranging between three months and four years for acts such as storming fields, throwing harmful objects, attacking people, bringing weapons into stadiums, inciting violence and participating in brawls. The bill requires clubs to create a registry of violent fans who would be barred from attending events. On Saturday, fans of Mexico’s most popular football club, Chivas de Guadalajara, fought with police after authorities sought to put out flares during a game against their western city rivals Atlas. Some 40 people were injured and 12 detained. The bill, which was approved 317-34, must now pass the Senate. Email “Four year jail term for hooligans if Mexican politicians get their way”. Feedback on “Four year jail term for hooligans if Mexican politicians get their way”.